San Francisco 49ers quarterback Colin Kaepernick threw for 227 yards and ran for another 98 against the Packers. 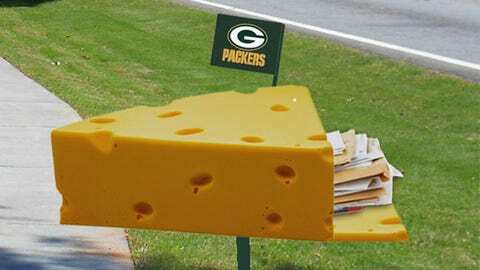 GREEN BAY, Wis. (AP) — Home or away. Late summer or during one of the coldest nights of the year. Doesn’t matter where or when — the San Francisco 49ers keep figuring out how to beat the Green Bay Packers. Phil Dawson kicked a 33-yard field goal as time expired, and Colin Kaepernick threw for 227 yards and ran for another 98 to lead the 49ers past the Packers 23-20 on Sunday night in a frigid NFC wild-card game. In a back-and-forth fourth quarter, the 49ers (13-4) threw the final punch. Kaepernick escaped a blitz on third-and-8 and scrambled for an 11-yard gain to the 27 with 1:13 left. "Just trying to figure out a way to get that first down," Kaepernick said. "Had a play called, we didn’t get the look that we wanted. It worked out for us." Dawson nailed the winning kick five plays later — but only after nearly being blocked by edge rusher Davon House. He was whistled for offsides on the play, but the 49ers declined the penalty with the win in hand. The defending NFC champions came away with a huge win in conditions that resembled a meat locker. It was 5 degrees at kickoff, and the winds made it feel like minus-10. San Francisco plays at Carolina next Sunday in the divisional round. "They got us the first time," linebacker NaVarro Bowman said, referring to Carolina’s 10-9 win on Nov. 10. "What’s on our minds is to get them now. It’s the playoffs. Win or go home." Mason Crosby’s 24-yard field goal tied it at 20 for the Packers (8-8-1) with 5:06 left before the 49ers’ final drive. 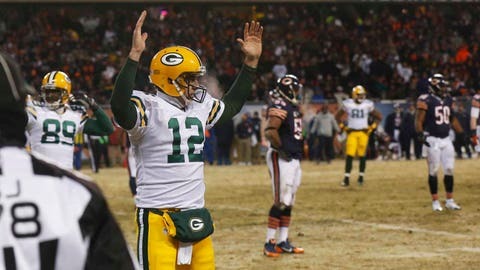 Until then, Packers quarterback Aaron Rodgers did his best to turn into "Captain Comeback" again. After a slow first quarter, Rodgers finished 17 of 26 for 177 yards and touchdown. Kaepernick connected with a spinning Vernon Davis down the seam for a 28-yard touchdown pass with 10:39 left. The score quickly answered John Kuhn’s 1-yard touchdown run that briefly gave the Packers a four-point lead. That TD was set up after Rodgers, in the clutches of a 49ers defender, somehow managed to escape a sack on fourth-and-2 and found Randall Cobb for a 26-yard gain to the Niners 4. Eddie Lacy ran for 81 yards on 21 carries for the Packers, while Frank Gore had 66 yards and a touchdown on 20 carries for the 49ers. 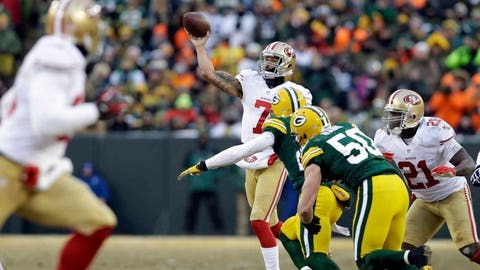 But it was Kaepernick who was the difference-maker once again in San Francisco’s fourth straight win over Green Bay. He finished 16 of 30 with the touchdown and an interception. For the second year in a row, the Packers’ season has started and ended with losses to the 49ers. 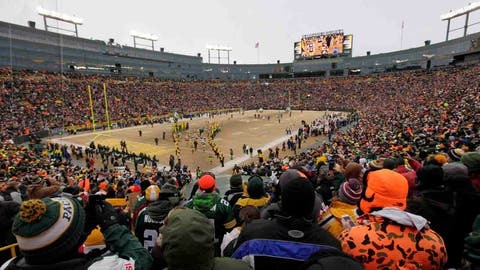 The latest edition of what’s turned into a chippy and heated rivalry took place on the worn, frozen turf of Lambeau Field. In a memorable playoff debut last January, Kaepernick ran for a quarterback playoff-record 181 yards and a pair of touchdowns. In the season opener in September, the strong-armed quarterback threw for a career-best 412 yards and three scores. This time, he did his damage on the ground and through the air. Kaepernick tore through the Green Bay defense for a 42-yard run, getting a break at one point after House whiffed on a tackle, to set up Gore’s 10-yard touchdown run that helped give the 49ers a 13-10 halftime lead. The Packers went without a first down in the first quarter before finally getting on the board with a methodical 14-play, 70-yard drive that ended with Rodgers’ 5-yard touchdown pass to Jordy Nelson that gave the Packers a 7-6 lead with 5:50 left in the half. The drive was set up by Tramon Williams’ 17-yard interception of Kaepernick to the 49ers 30. In the end, Kaepernick came out with another win. The 49ers’ nasty defense got pressure on Rodgers most of the day, but the Packers still rallied in the fourth. A depleted Packers defense — already playing without linebacker Clay Matthews — lost two more starters Sunday in cornerback Sam Shields and linebacker Mike Neal — but still managed to hold its own against the Niners.